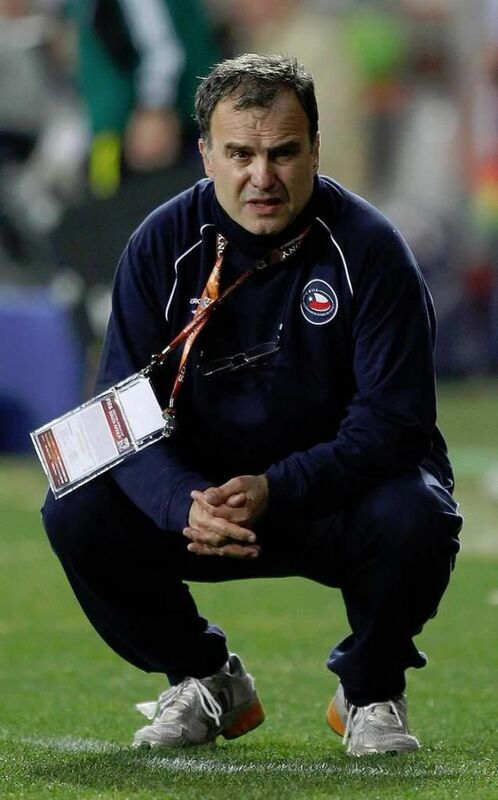 Six years as coach of Argentina and four in charge of Chile endeared him to the world, but with international football placing obvious restrictions on how much a manager can shape his team, there has always been a lingering question – what would Bielsa do with a club side? His previous experience, with Espanyol, was rather unsuccessful. He only lasted six games before he left for the Argentina job, leaving the club in 18th position in La Liga. The players struggled to adapt to his methods, he struggled to adapt to the demands of European football. Back in Argentina, however, he’d been a successful club manager with his hometown club Newell’s Old Boys, as well as Velez Sarsfield. His arrival in Spain as the new Athletic Bilbao manager is one of the most exciting developments of the summer. At one point, it seemed that he would become the new Inter coach – but he had promised Josu Urrutia, a candidate for Bilbao’s presidential election, that he would take over at Bilbao if Urrutia won. He did, and true to his word, Bielsa came. The suspicion is that Bilbao is a better home for him than Milan, on various levels. These range from the very basic details (Spanish-speaking manager will immediately be able to communicate in Spain rather than in Italy) to the composition of the side. Athletic are a young, energetic team who played high-tempo, vibrant, Bielsa-style football under his predecessor Joaquin Caparros, whereas Inter are used to playing slow football and defending deep, and also have an elderly side. There is more to it than that, however, because Bilbao are no ordinary club. Their policy of using only Basque players gives them a defined identity that few clubs can match. Their insistence on bringing through youth players has already been embraced by Bielsa, who has not asked for any specific new signings. As an incredibly thorough coach, he should, in theory, thrive in an environment that encourages cohesiveness - and on another note, a club that doesn’t see winning as the be-all and end-all of being a football club. Specific tactics don’t survive for a century – thankfully – but general style can. Ever since those days, Athletic have been regarded as a side that play direct football, particularly in contrast to the tiki-taka style of the national side of recent years. That reputation survives to this day – to the point where, when Spain need to switch to a direct style of play, they bring on Bilbao’s striker, Fernando Llorente. Bielsa, a man notorious the speed and directness he demands from his players in possession, is surely at the right club. So, what exactly is he going to do at Bilbao? Let’s start with the formation. Bielsa is most famous for the unusual 3-3-1-3 shape he’s used with both Argentina and Chile, although there is a caveat to this – and therefore a reason why he probably won’t use it as his first-choice system in Spain. With Chile, he always wanted a spare man at the back – a back three against two strikers, a back four against one striker (with the full-backs pushing high up into midfield, effectively leaving 2 v 1 at the back). This meant a switch between 3-3-1-3 and 4-2-1-3 depending upon the opposition – note the World Cup game against Honduras, where he responded immediately to Honduras’ tactical switches to keep his cover at the back. South America is still – largely – based around two-striker formations, which meant that the 3-3-1-3 was his favoured formation. Spain is overwhelmingly dominated by 4-2-3-1, which makes the situation more complex. All this might turn out to be irrelevant, however, because so far Bielsa has favoured something called a 4-1-4-1 in much of the Spanish press, although it retains many of the characteristics of the 4-2-1-3. ZM was at the friendly against Tottenham on Saturday to see the side in action, and Athletic lined up with the system on the right. The two most interesting roles on that teamsheet are the two defenders on the left-hand side – Javi Martinez and Oscar de Marcos. Neither are defenders. Martinez is naturally a holding midfielder, and has played for the national side in that position, whilst De Marcos is a young winger/forward who wears the number ten shirt. Bielsa often used midfielders in the defensive line for Chile, believing they were more mobile than some of his centre-backs, and also better at starting moves. The shift for Martinez is perhaps not surprising, because Bielsa always wants a very defensive-minded holding midfielder – a pure stopper, like Gary Medel. Martinez is more of a ball-player, and therefore, whilst it may seem strange to move a player into the defence because his strengths lie in playing the ball rather than winning it back, it’s not completely unexpected. At 6′3 he has the ability to challenge in the air, although in this friendly Roman Pavlychenko got the better of him with high balls. The use of De Marcos at left-back was more surprising. He performed reasonably well, seemingly having a good relationship with the left-winger, Igor Gabilondo. 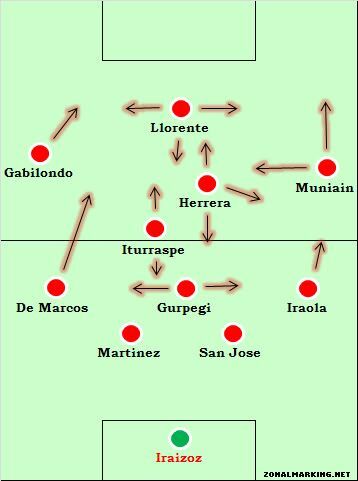 Like wingers in many of Bielsa’s teams, Gabilondo stretched the play and stayed wide, meaning that De Marcos’ runs were often diagonal, towards goal rather than down the line, as the space was on the inside of Gabilondo, rather than the outside. This helped De Marcos, as he is right-footed, and therefore wanted to come inside anyway. On the other flank, Iker Muniain was the brightest player. He usually went down the line, but also came inside to the middle of the pitch, and sometimes switched with Ander Herrera, the playmaker. Again, this is classic Bielsa – he doesn’t want to burden one player with the sole playmaking responsibility, which can become a problem with the basic shape of his preferred 3-3-1-3 / 4-2-1-3. By coming inside, Muniain became another source of creativity. Andoni Iraola generally overlapped, though played more conservatively than De Marcos. Herrera was the player with the most unpredictable movement. As well as moving wide, he also made forward runs to go beyond Llorente – indeed, he had a good chance in the opening minute from a ball over the top after Llorente had dragged defenders away. Herrera found space wherever he could – sometimes he moved deeper than Ander Iturraspe, to add some element of surprise to the way Athletic played in the middle. At half time, Tottenham switched to a 4-4-2 having played Pavlyuchenko upfront alone in the first half. This meant Bielsa switched to three at the back – more specifically, it was pretty much the 3-3-1-3. Gurpegi became the right-sided centre-back, and there were substitutions at left-back and right wing – everything else largely stayed the same. Athletic were much less comfortable in this system, however. The main problem seemed to be the wing-backs (or the players on the outside of the diamond, if you like) – who played too deep, forced back by Aaron Lennon and Gareth Bale. This meant Athletic looked like a 5-2-3 too often, conceding the midfield ground and being completely overrun in the second half. This supports the idea that 3-3-1-3 might be unworkable in Spain – a country home to many tricky wingers. In comparison, as the Copa America showed, South America is not currently the place to go for top-quality wide players, at least at international level, so that is something of a new problem for Bielsa. Athletic were more patient in possession than we have come to expect from Chile – they were happy to hold the ball in midfield in the first half, and knock it back to the centre-backs to start moves from deep. There was more of an emphasis on changing the tempo of attacks rather than being direct straight away – they would work the ball into an area of the pitch where 2 v 1 situations could be created, and then charge towards goal. Creating overloads in specific zones has always been one of Bielsa’s main priorities – even a five-minute stretch of Athletic’s warm-up consisted of players practicing give-and-goes at high speed. There was a focus on passing out from the back, with the two centre-backs coming deep to collect the ball and the full-backs pushing wide. The full-backs look as if they charge forward constantly, but actually they’re simply intelligent with the timing of their runs – only moving forward when there’s space to exploit (whether on the outside or the inside of the winger ahead of them). The focus on possession means that a three-man central midfield is probably necessary. The first half featured a holder (Gurpegi), a runner (Iturraspe) and a playmaker (Herrera) and things went well. When the runner was removed in the second half – or rather, when the runner became the holder – Athletic looked disjointed. Herrera had to come deeper to get the ball, Llorente was starved of service and couldn’t become involved. The removal of Muniain, who picked up a knock in the first period, also meant their best out-ball was no longer an option. Pressing was, of course, high on the agenda – although it was not as frantic as we often saw with Chile. Athletic seemed happy to let Tottenham’s deepest man (often Michael Dawson) to have time on the ball, and Llorente would focus on cutting off the passing angles, as would the midfielders in deeper positions. Tottenham constantly conceded possession in the first half, largely because of the pressure in midfield. The second half collapse was probably also due to Athletic not being at full fitness, and therefore unable to press for the duration. As mentioned previously, Athletic were extremely prone to pace down the flanks. The two goals they conceded were assisted by Bale and Lennon, and the latter also won a penalty which Niko Kranjcar missed. That was most evident in the second half, but was also a problem in the first – and Bielsa may need to drop his ‘runner’ in midfield deeper to give the full-backs extra protection if this continues to be an issue, which would make the system very much the 4-2-1-3. Despite the eventual defeat, this was an encouraging performance from Athletic. They controlled the game in the first half, passing and pressing well. There are too many variables to accurately judge why they fared so poorly in the second half – Bielsa changed shape but Tottenham did too, introducing their two most valuable players (Modric and Bale) in the process. On this evidence, however, the first half system is better for Athletic – it gave more midfield options and the side was less compartmentalized. The 3-3-1-3 would need much more positional work. Still, his job in Bilbao is hugely exciting. Often seen as an inflexible manager who sticks to his methods even when they aren’t the logical option, he’ll have to show that he’s adaptable enough to incorporate the qualities and attributes that took Bilbao to sixth in La Liga last year. That might mean a back four and more patient build-up play. Whatever happens, it will be a fascinating season for Athletic Bilbao. Great read. Has always been a fan of Bielsa. 1. What about Llorente’s status with the club? Interesting what will Bielsa do if he leaves. 2. Can’t Bielsa use a hybrid of 3-man 4-man defense like Mexico;of course he’ll have to find a libero, but can’t he use a defensive midfielder? The worrying part of Bielsa’s tactics for me is that when his side wins possession high up the pitch, they seems like err… lacking ideas somewhat. Maybe his sides has always been too young (less exposure), but still, it’s always a case with his tactics. Read your article about playmakers. But I can’t agree with you that there’re only two types of playmakers. The playmakers, well actually makes the play. So in your view can we consider Rory Delap as a playmaker for Stoke? About your point of Bielsa’s sides not having many ideas when they win the ball, I can assure you that Muniain, Llorente, and Ander know exactly what they want to do with the ball before they even get it. Some of Bilbao’s attacking players are very intelligent, in particularly Muniain who looks like he will be a very important player in the future, when he’s on his day he can torture defenders. Well the Sacchi saying was that whomever has the ball is playmaker. At Barcelona you could argue that Pique is the first playmaker and at times Valdes is when playing as a libero. I agree about the Barca/ Mexico system. Hmmmm defender as playmaker, maybe we can call it Libero. Are the defender and the goalkeeper you talking about really look for someone in space on front line, or he just kick the ball into box. I guess they only look someone and kick it, so they are not playmaker. That just a direct Football. He has played in the center in a 2-4-4 (we’re in stone age really) few years ago, but wasn’t good enough. He’s not even the best goalie in this particular side but the coach wants his ability to play long balls because his team his very weak in midfield (to understand I’ll give them a rating of 20s in video games). It’s not clearing actually, but it look like that to me as I watch top level football. About that goal, yes Cesar isn’t a playmaker. But can we limit the playmaker to the one who make the final touch. In that sense, Ozil is better than Xavi because he has made 20 something assists. What??? 2-4-4, do you have a video or something in youtube, just take it easy man, there are no “Dark Age” in football tactics, everyone have their own reason to make a tactic based on the squad. But my sense tell me that your team play only direct football. and also we can’t say playmaker was the one who make the final touch too, that’s depend on the strategy and situation i think.. Ozil made more assists because his team play direct Football, so his position little high on the formation. Same situation at Inter-Bayern Final. while Barcelona play the “Build up” football, so Xavi sometimes play deep to create the game from the Back, he create a space for his teammate and then pass to that space. If you change Ozil and Xavi, i’m sure ozil can’t play as good as xavi in Barca and of course xavi too. So I can’t assume which one are the best playmaker based on assists. Maybe if your GK or Defender can make that space and cleverly create a chance, we can consider them as playmaker. only my opinion. I didn’t say “we’re in stone age” without a reason. Whole South Asia is dominated by cricket (and Rugby in Sri Lanka- ranked 5th in Asia). The television channels broadcast a football match once in, say 6 months. I agree about the playmaker. But what I intended to say was “we can’t define a playmaker”. Football analysts often misunderstands that playmakers are only trequartistas or deep-lying playmakers or passing midfielders. Players like Rafael Marquez sometimes plays a playmaking role for their team but he doesn’t belong to any criteria above. I think the focus was on center-of-the-pitch midfield playmakers, with the term “playmaker” used in the venacular, rather than literal, sense. 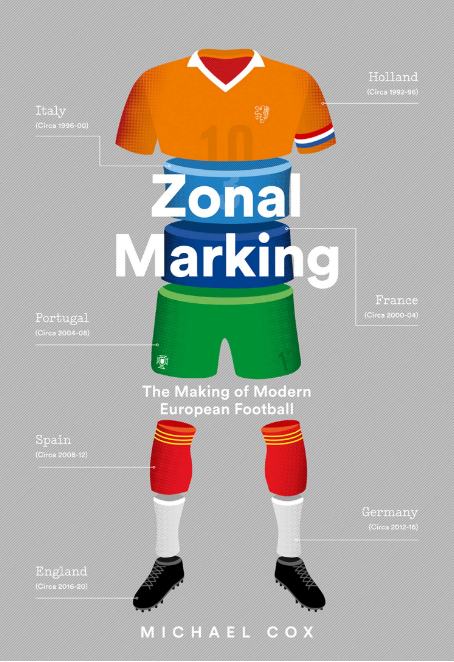 ZM, you are getting better and better with this articles, far more exciting to read than simply game analysis. I can’t wait to se Bilbao with him in charge. They could play some attractive football, high pressing, tempo, attack. Bielsa is someone who is inovating and brings new thing, his things. That’s always interesting to watch. Great article, i’m excited to see more from Bilbao this season. What bugs me a little is clubs like Bilbao who have more in their agenda than winning (i’m a bit competitive). I would be so frustrated being a coach there, only bringing in Basque players. Funny, because I was thinking the opposite: it’s refreshing to see a team – in this modern era of “win at all costs so we can sell more tickets and merchandise” – where they act like it’s not just about winning, but about how you play the game. It would be a crime to play Javi Martinez as a center back. His strengths are not playing the ball rather than winning it back. His strengths are playing the ball AND his physical dominance in midfield. Best seen at the U21 where he ruled the midfield. He can probably play just fine as a center back, but for me he is one of the best midfielders in the world. I checked Bilbao’s other lineups in the pre-season (Marca). Martinez had only played 2 times before. The first time he played in midfield. The other time he replaced Iturraspe in midfield after 45 minutes. But with several other changes during halftime, it’s possible that he played in defense, but with no mention of this, it’s most likely that he played in midfield. So hopefully the Tottenham match was just a test or a tactical maneuver and not how he intends to play during the season. Especially considering that Bilbao have San Jose, Amorebieta and the emerging Ekiza for that position. Would make no sense to weaken the midfield to replace any of those. Bilbao look really exciting. Ander and Muniain are great prospects, and to emphasise the attacking tenets, it’s also worth noting that Iraola can play further forward as a winger, so is really comfortable if asked to bomb forwards. I agree that there will be no need for Martinez to play centre back generally, Amorebieta and San Jose are a solid partnership. Still, if this side are given a year or so to adjust to Bielsa-style crazy pressing, high-tempo, attacking football, they could be something special. Agree about Muniain, he looked excellent for the U-21’s, as did Martinez and Ander Herrera. I honestly think Bilbao have a chance to finish in the top four. All of Valencia, Villarreal, Sevilla, Bilbao, and Malaga have decent chances to make a run at the Champions League places. Main reason Javimar was in defence was that both Amorebieta and Ekiza were injured. It is telling though that Bielsa didn’t even bring backup cbs Ocio or Ustaritz in the squad. Also, De Marcos has played at full-back before – and is probably Iraola’s backup currently – but yes, his natural position is on the wing. Regarding Llorente; I think he’s staying at Athletic (for the moment at least), but the team isn’t as reliant on him as they were before. 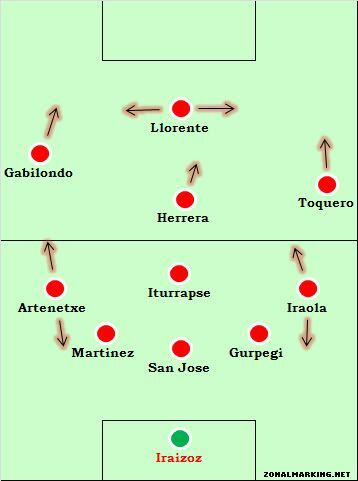 Under Caparrós Plan A, B and C was long ball to Llorente but now there are other options. Great article. I’m very curious on how Bielsa will shape his side against the likes of Madrid and Barcelona, both of which have arguably much superior sides on paper. Also, I wonder how much differently his club tactics will be compared to international games, taking into account the higher number of club matches and greater rate of fatigue. Haven’t seen the match taken place in London. 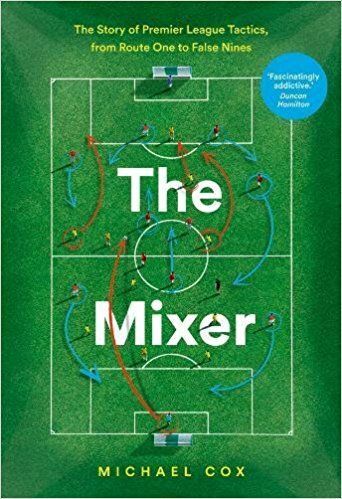 In any case, an interesting, in depth analysis of Bielsa’s vision towards football, given ideas of his already implemented in the past. Also in reference to the recent friendly vs Spurs (away), the article identifies the tactical directions he is seeming willing to follow in Bilbao. A lot of sophisticated stuff in his work, with radical tactical changes during the match (eg formation and defensive structure in 2nd half), players in “unusual” roles (J. Martinez as DC, De Marcos as DL) etc. Very interesting also the idea of “changing the tempo of attacks” -as well as extremely demanding. The obvious prerequisite here is mature players who are thinking people on the pitch. Controlling the game and keeping possession, patiently searching or / and creating the circumstances so as to suddenly highten the pace of circulation and surprise opponents. Athletic Bilbao is the most historic team in Spain, and we only play with players from our own region. You can buy more mercenary players, but you will never have the dignity of Bilbao. Historic in what sense? Recreativo is older, Madrid has won more, Madrid, Barca and Athletic have never been relegated. So historic in which way? Bilbao have never been relegated and were the original 5 to form the League in 1929. That is historic from any criteria. I agree with Athletic Bilbao’s philosophy. I’d rather just play with people from my own region rather than letting half-breeds from abroad play. I’d rather my teammates had the same skin colour as me thank you very much – then you know where you stand. It’s a positive thing to exclude others who are different from our club, we are superior to other clubs because we are a pure race untainted by mongrel blood. Copy & pasted straight from a summary of Mein Kampf. Everyone has their opinions, doesn’t mean everyone should have to hear/read it. Just check his user name. The guy’s trollin’. Fantastic work, but quite verbose. Try and include a few more diagrams like you used to do. Definitely. ZM’s style has matured over the past two years, and so has his audience. He doesn’t need to use diagrams to show us how the wingers move from a 4-2-3-1 to a 4-4-1-1, for example. In a sense, ZM is an academic course in football tactics. Thanks, prof! I don’t agree with the view that lack of imagery is OK.
Future in this sort of niche analysis is Video. As Allas does in his videos of Barca. ZM will have to adapt very soon, ‘coz no matter how articulated and brilliant a writing is, its no match for Video analysis in this sort of analysis. Matured in his style? Doesn’t need diagrams? Who are you kidding? Tim Hill is a fantastic writer, and more eloquent and succinct, and he uses diagrams all the time. been waiting for a bilbao match after watching martinez n herrera in euro u21, especially herrera. martinez looks like a real leader on the midfield and herrera reminds me of iniesta in terms of simplicity and unpredictability. Se tutti questi numeri facessero girare la testa agli avversari come a chi li legge o studia, el loco avrebbe un palmares personale molto più corposo. ZM, would love to read an article on Arsenal and what you think they should do in the transfer market. They seem to be a sinking ship at the moment, if Liverpool spent their money on talented players instead of over-priced british ones, they’d be gauranteed to take fourth spot off arsenal and with their history and spending that’d be it, no coming back for arsenal. Very nice article. I’m also excited about the style of Athletic’s play in next season. But for me, the 3 man defence system in Spain is quite suicidal. Just like playing with Javimar as centre back. Athletic Bilbao may lack of his quality in midfield. De Marcos on left back can be interesting choice, especially that Bilabo lacks quality on that position and they don’t have such player as Iraola on the left side. Under Bielsa’s management, Bilbao side can be very interesting team in the next season – especially becouse of the partnership of Munian and Ander Herrera, two dynamic and extremally creative players. Cheers! I disagree with a lot of what’s been said here. 3 man defence’s are not suicidal. they’re very sophisticated, elegant and show/require great tactical intelligence to execute. the fact that a team sheet shows 3-4-3, 3-5-2 or any other phone number doesn’t mean a team plays with 3 defenders all the time. similar to 4-4-2 or 4-3-3, as football is about movement, space & transition. playing 3 at the back is more common than you think. obvious team that play that way include Barcelona (4-3-3, but when both fullbacks bomb forward, Busquets drops) Zaragoza (typical Aguirre team, shifting between a 3, 4 & 5 man defence with very intelligent players occupying space in attack & midfield…too bad they lost Gabi) & Deportivo. Bayern did it with Louis van Gaal, looked amazing with Schweini, Robben & Ribery at their best. Bilbao lacks nothing but a variety of options. limiting themselves to Basque players may seem like a set-back, but the ones that make it through are genuine quality. Bielsa’s players usually occupy atleast 2 positions, and his wingbacks are usually one attacking, hug-the-line, work the flank type of player (Isla, Sorin, Iraola) and on the other side, a more composed, playmaking player who can move into a central midfield position (Vidal, Zanetti, De Marcos). Aurtenetxe can play as LB or CB, he is young, dynamic & promising. Bilba0 had Koikili who was OK, but Bielsa will most likely promote a canterano if need be. Javi has occupied a role similar to Busquets @ Barcelona with the U21. he is one of the true/rare all-rounders of the Spanish game. a holding midfielder with the youth categories, he has a strong presnce as a box-tobox marauder, and now has shown great distribution when played as the last man. if he can work on his defensive aerial game, he’ll be even better. My only concern with Athletic is what to do when Llorente goes through a faze? the new system doesn’t depend much on him as an individual, & requires more effort, movement & sacrifice. Caparros has done a great job moulding him into what he is today. It depends on him, but with Bielsa, I can see him becoming a firm starter with la Furia Roja. I have always been a fan of Bielsa. He is a coach with clear ideas and his sides are always exciting. For me, football is not just about winning though winning is most important. Clubs like Bilbao and what they stand for make the game more interesting. I do hope that Atletic do well this term, even as a barca fan. this is a great article. I would not have minded a little bit more about how Tottenham looked, but I am always delighted to hear about Bielsa and I’m glad he made his way to a team like Bilbao. Inter – new coach, new approach? Lille – will they be able to cope with the loss of Cabeye and Gervinho? aside from Inter & Gasperini (and to an extent Pellegrini’s Malaga), what can be said about the other teams really? this artice previews a coach with a set of footballing ideals, values & strong beliefs. the same cannot be said about 99% of coaches these days, with all due respect. Look, I’m not saying that Pioli, Garcia or Kombouaré is necessarily btter or more interesting than Bielsa, whom I hold in very high regard. For example, as ZM discussed in the game recap for the French cup final, Lille play 433 with on CM holding very deep (Mavuba) and the “wingers” given free roles to come in and link up with Sow, and ideally the fullbacks overlapping into the space those wingers vacate. Having lost their regista (Cabeye) and one of their wingers, will this formation still be feasible/effective given the personnel remaining? Is there something else that might be suited to their players? Can two of Pedretti, Balmont, and Gueye combine well in front of Mavuba? Will Payet or Obraniak wind up on the wing? No, obviously you’re right, there’s nothing to say about these teams, especially since genii like you already know everything. point taken, although i don’t understand your anger. “with all due respect” wasn’t directed towards you, but to the 99% of coaches i mentioned above. what i meant was, 99% of managers work with the players they have, moulding them into a “winning formula”. Bielsa, Pellegrini & Gasperini have a set ideal in football which they implement onto their players. they will always press, play simple football, & tactically manouver their teams within certain guidelines they’ve set themselves. thanks for the genius tag, much appreciated! That’s right, please make an article about Inter Milan new strategy..